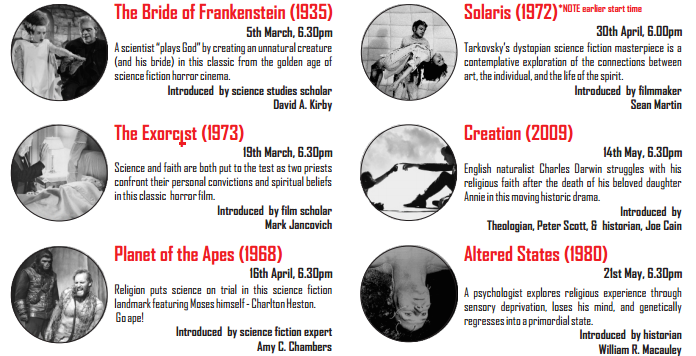 The Science and Entertainment Lab’s inaugural film series ‘Playing God: Science and Religion on Screen’ ran from March to May 2015. We screened six films with introductions by a Bishop, a theologian, film scholars, a filmmaker, and historians of science. Our wonderful venue, the International Anthony Burgess Foundation (IABF), was busy at every screening. The post-screening discussions were vibrant and engaged with a constellation of themes concerning the intersection of science and religion on screen. We include below some brief roundups of each screening as well as a storify of #PlayingGod. The series was launched with an introductory talk by the Bishop of Manchester, the Right Reverend Dr David Walker. His views on science and religion were thought-provoking and several scientists in the audience commented afterwards about how impressed they were with his views on the subject. He remarked that cinema was an excellent way to get people thinking about where and how science and religion overlap and complement one another. As a student of science in his undergraduate days he is the material embodiment of the bridge between science and religion. The SciEntLab’s Principal Investigator, David A. Kirby, added his own insights, focusing on the religious input into the censorship of the film. There were plenty of questions and discussion about why the scientific content of the film was problematic for the censors. The group discussion extended to the portrayal of the scientist Henry Frankenstein as a Christ figure and creator. Prof. Mark Jancovich (University of East Anglia) was guest speaker for the ever popular and ever uncomfortable movie The Exorcist. Mark juxtaposed the film with the French Connection, visually situating the film within its historical context. In the run up to the screening we discovered that the film had a religious advisor who ensured that exorcism was presented authentically. This meant that of all of the issues that the Catholic Church had with the film they had no complaints about the portrayal of the rites of exorcism. 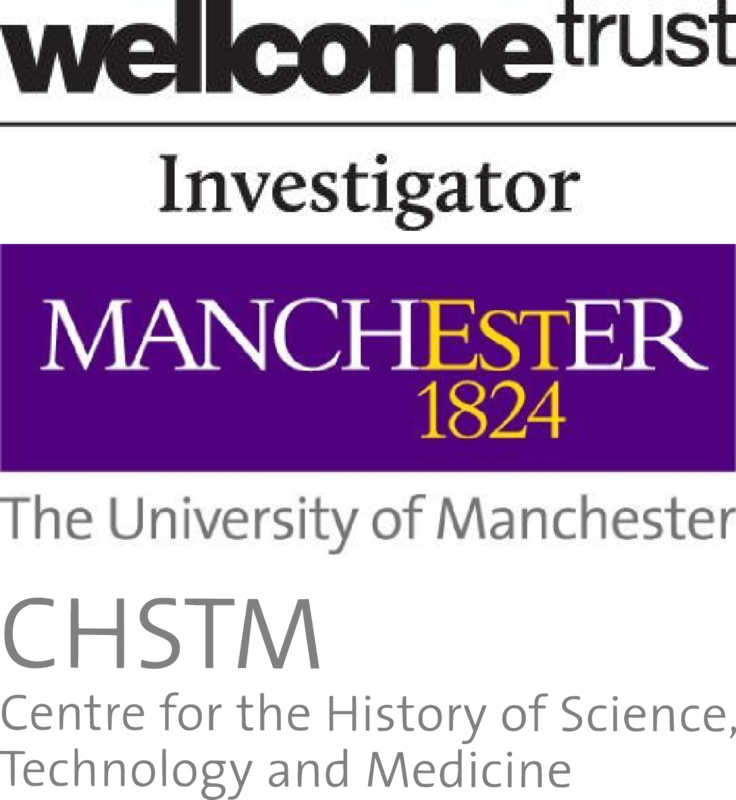 We also discussed the frightening nature of the presentation of science as a clinical and painful failure, and the contrasting image of religion as saviour. This film shifted the series away from horror to speculative science fiction. The portrayal of evolution in the film was a central concern for many audience members, particularly how filmmakers used evolution as a rhetorical device. In her opening commentary SciEntLab’s Amy C. Chambers talked about how references to evolution were deployed in the marketing of the film – but slowly reduced in specificity as the film was developed. We discussed how the oversimplification of science as a homogenous idea (‘science vs. religion’) lost the more complex and specific science-based discussions going on in a film that incorporated bioscience, animal science and psychology amongst others. Author and filmmaker Sean Martin focused on how the incomprehensibility of alien life as a key theme in this film. Unexpectedly, given its length and complexity, Solaris was our best-attended film with many enthusiastic about getting to see the 1972 version. The cerebral nature of this film led to a thoughtfulness on the part of the audience and panel in the content of their questions and responses. Creation, identity, love, spirituality, art, and the limits of human understanding were raised as issues in the film. The alien qualities of ‘the entity’ (the Ocean) led audiences to wonder how it could mesh with our own sense of meaning through religion. The Ocean is most clearly ‘playing god’ in the film as it manipulates and replicates the human characters. We had a double-bill of speakers for Creation. Prof. Peter Scott talked about how naturalist Charles Darwin and this biopic challenged the theological idea of “the human” as exceptional. He asked whether we should be grateful for this challenge. Prof. Joe Cain relished his role as devil’s advocate as he critiqued the merits of the film and challenged the audience to view the film intellectually in order to question the processes of filmmakers who tried to balance discussions of faith and science with a biopic of Darwin. Joe gave the filmmaker’s credit for giving Darwin’s wife, Emma, a significant role – she had a clear position in the life of the theory and the theoretician. We also discussed the Darwin industry and the mythology of Darwin and the need to create a biography by numbers. The attachment to historical detail obfuscated a discussion of the theory and its implications for an understanding of science and God/Christian faith. The series closed with one of the most challenging films in controversial director Ken Russell’s Altered States. 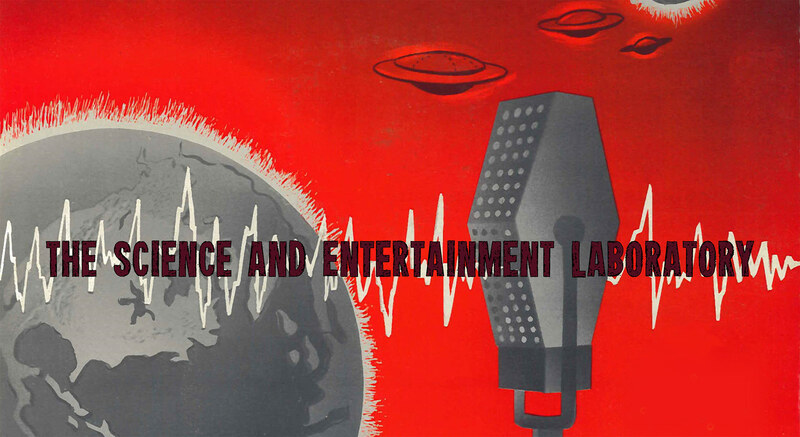 SciEntLab’s Ray Macauley discussed the film’s fraught production history and the 27 directors who passed on taking the project before Russell took the helm. Ray discussed how Russell was a late convert to Catholicism and many of his films have a strong link visual and rhetorical link to the Church. However, he noted that Russell’s relationship with Catholicism was irrevocably damaged after his 1971 film The Devils. The post-screening discussion highlighted some intriguing points about the film’s inconsistent use of religious allegory and its portrayal of scientific research in elite American institutions. Altered States linked in well with the discussion of Solaris in terms of the metaphysical aspects of religion and the outer limits of science. Below is a Storify of the screenings, detailing the films and cultural dialogues surrounding them, the introductions, and the post-screening discussions that occurred at the event and over Twitter, via the hashtag #PlayingGod and our twitter account @SciEntLab.